Our laboratory research focuses on the epigenetic regulation of normal and malignant hematopoiesis. That is, how do epigenetic factors regulate the balance between self-renewal and differentiation in hematopoietic stem cells (HSCs), and how do genetic mutations in epigenetic regulators alter these processes and contribute to blood disorders such as myelodysplastic syndromes (MDS), acute myeloid leukemia (AML), and T-cell acute lymphoblastic leukemia (T-ALL). Well if you ask me I would say they are all exciting! The major focus of the lab is identifying cell extrinsic and cell extrinsic factors that contribute to the clonal expansion of pre-leukemic HSCs in clonal hematopoiesis of indeterminate potential (CHIP). We now know through genomic sequencing of large cohorts of healthy elderly individuals that virtually everyone over the age of 50 carries some HSCs in their bone marrow with genetic mutations we know cause cancer. One of the major questions in our lab is what is different in people with CHIP who go on to develop a blood cancer, versus the vast majority of the population who live with benign CHIP for the rest of their lives. Mentoring students is something for which we are not trained for during our PhD and post-doctoral studies, but it arguably the most crucial aspect of our jobs. My philosophy is that all trainees need to be treated as individuals, or n=1. I ask them when they are interested in joining my lab what their career goals are, and we sit down together and map out a career development plan to get them to where they want to be, whether that be academia, industry, teaching, consulting, or any other discipline where trainee are heading these days. My job is to give them the skills they need to be successful in their career after they leave my lab, whatever that discipline may be. I am not out to clone myself and generate academic progeny, but rather to work with the trainee to prepare them for future success, wherever that may be. We recently had a manuscript published in Cancer Cell which is the first paper I have had at that journal. It was spearheaded by a truly exceptional post-doc, Dr. Hamza Celik, but was the cumulative effort of a great supporting team, representing about 5 years of work. We have been celebrating that one for a while! I wish I knew the answer! If there was one magical solution then everyone would be doing it! I would just say I try to be enthusiastic and keep a positive attitude. 90% of the experiments we try will fail, so don’t give up. Similarly, most of the grants I write will not be funded. Just keep grinding away, and then those projects that do work will be sweeter. And you need to appreciate and celebrate the good results when they come! Like most hematology labs, we do heaps of flow cytometry so the AutoMACS in our lab is invaluable and we rely on the Siteman flow cytometry core a lot. Also, now that CRISPR/Cas9 applications are becoming more commonplace, we utilize the Genome Engineering Core for mouse transgenics, and we also perform a lot of experiments ourselves in primary human patient-derived cells using the Neon system. We also do a lot of low-cell-input genomic profiling for which we rely on the sequencers at the Wash U Genome Technology Access Center (GTAC) and McDonnell Genome Institute (MGI). The two steepest learning curves in setting up your lab are things we get no training for during your PhD and post-doc – financial management and personality management. For finances, you have to quickly understand how to pay for your experiments. Preparing budgets for different grants, you have to learn what costs are allowed for certain projects and what can be paid for from different accounts. For personality management, you have to try to understand what makes each of your trainees tick to get the best out of them. And also make sure everyone enjoys their lab experience to maintain a vibrant lab culture. Be positive! Be enthusiastic! And follow your passion – even if your favorite field seems over-crowded. The first few years of starting your lab was arguably the most fun I have had in science. For the first time there is really nobody looking over your shoulder telling you what to work on. You are largely free to pursue you own interests. But that can also be intimidating, the safety net of your PI is gone now! But overall I love my job. I love that every day is different and you never know entirely what is going to happen. A result we get in the lab may have never been seen by anyone in the world before, which is incredibly exciting. The best part of my day is having a trainee excitedly knock on my door to show me a new piece of data hot off the press. Yes we regularly attend and present oral and poster abstracts. Apart from the great socializing and parties at the annual meeting, its great to meet peers at similar developmental stages in their career. These have become my colleagues who I collaborate with scientifically, critically read my grants and manuscripts, and help me through problems that arise at different stages of my career. We celebrate any number of ways. We often go to Cardinals baseball games in the summer, or I have the lab over at my place for a BBQ. When the weather turns cold, we have taken an afternoon off to see new release Star Wars movies, play Lasertag or go bowling. And of course we often go for happy hours on Fridays. Something I inherited from my former mentor was having lab Halloweens. 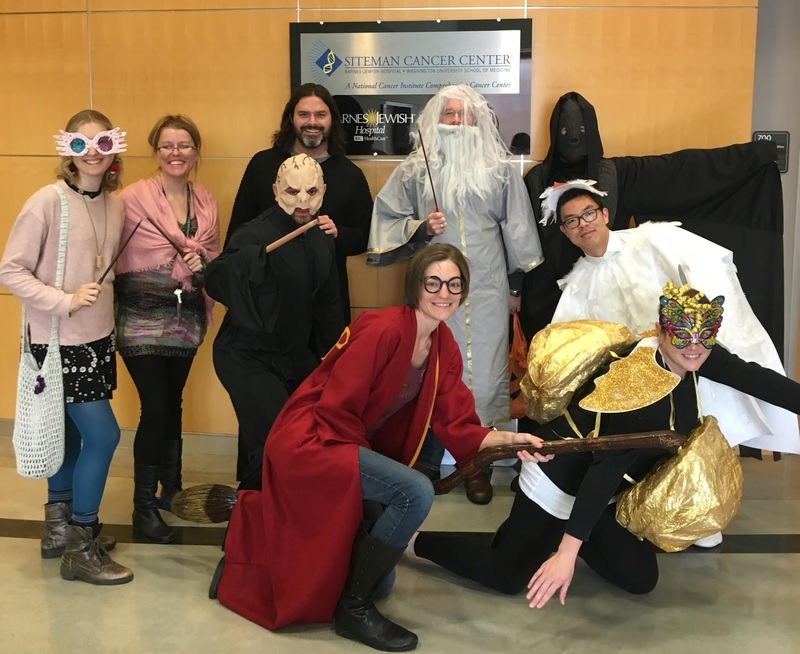 It’s fun to dress up in theme for the day and visit the other labs on campus, and we go to the children’s hospital and hand out candy to some of the patients.